Açai berry extract (Euterpe oleracea), native to Brazil, offers an exceptional nutritional composition of vitamins, minerals, fiber, essential fatty acids, amino acids, and anthocyanins. Pure Encapsulations açai berry is harvested by hand in order to preserve the integrity of the palm tree and the delicate rain forest ecosystem. Berries are also hand sorted and selected for quality. In this formula, açai is combined with blueberry, pomegranate, cranberry, and raspberry for additional antioxidant support. 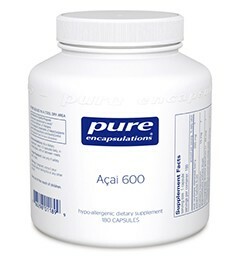 Açai 600 provides the broad profile of açai nutrients combined with antioxidants from blueberry, pomegranate, cranberry and raspberry. 47 points will be rewarded to you when you buy this item. Earn free products. Click on the green "i" for more information on our rewards program.